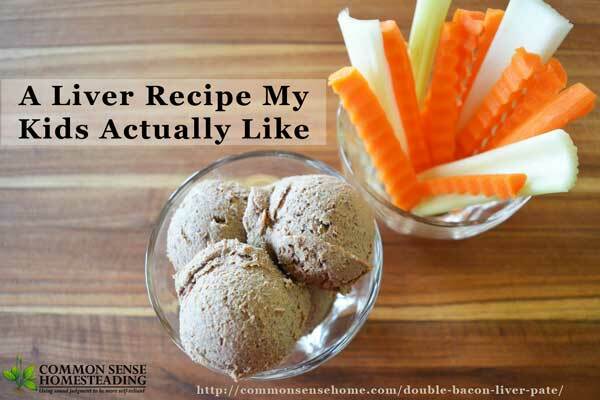 Because it's easier to get some people (like my kids) to eat liver if it's paired with bacon, today we have the recipe for Double Bacon Liver Pate. Before you say “Yuk!” because it's liver, just remember everything's better with bacon. 😉 Also, if you've ever priced out pate in a store or restaurant, you know that it can be some seriously expensive gourmet fare. In a heavy skillet, fry the bacon until barely crispy. Remove the bacon and drain on paper towels, reserving the drippings in the pan. Turn the heat to low. Add the butter and saute the onions and mushrooms for 15 minutes, or until completely limp, stirring occasionally. 4 ounces of raw chicken liver has about 20 grams of protein. Because the protein is of animal origin, liver contains all of the amino acids essential to human health. Liver provides the most concentrated amount of vitamin A of all food sources. It is considered an efficient aid in vitamin A deficiency. Beef liver provides 18,000 mcg of vitamin in 3 1/2 ounces. Liver is a good source of the mineral phosphorus. A diet which includes large quantities of liver also should include added calcium since high phosphorus intake can create a deficiency of calcium. Liver is one of the few natural sources of vitamin D, and it is also an excellent source of all the B vitamins (particularly B12), copper, vitamin C, and trace minerals. 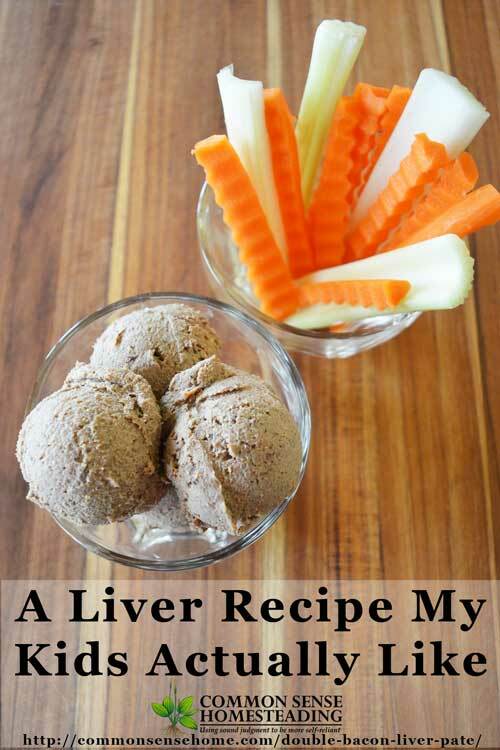 An easy to make liver pate that is so tasty even my kids will eat it. You can also freeze the pate in small portions using a scoop or an ice cube tray, and then defrost a little at a time for later serving. 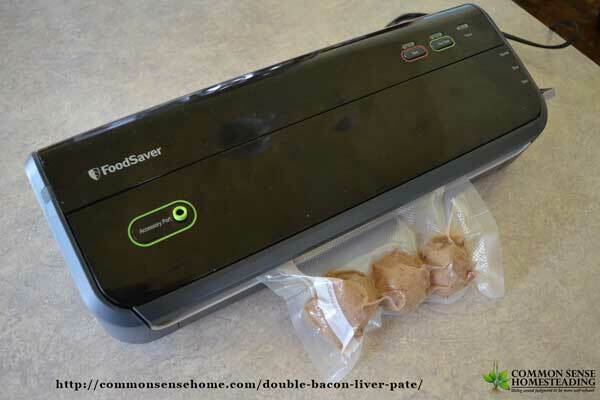 Here I used my FM-2000 vacuum sealer to store 3 small scoops of liver pate. Don't forget to mark with the contents and date. Sounds Yummy! I might get Elaine to try it if I tell her its got bacon in it. An Remember, sometimes it takes up to 10 times trying something before you decide if you like it or not! Perfect recipe! I am pregnant and have been looking for a palatible liver recipe to have on hand, since the stuff is so great for you while you are preggers. I’ve got both grassfed beef liver and pastured turkey and chicken livers frozen and ready to use…..
Cathy – it freezes well, too, so sometimes I pack it in an ice cube tray, and then just pop out a cube or two as I need them. Have a safe and healthy pregnancy! OOPs, Sorry, forgot to tell you to form into mushy meatball shapes first. They will firm up nicely when cooked and be so tender and lovely. Thanks, Ann! I have a bunch of grass fed beef liver that needs to be used up, too. Unless you live in France, where liver pate is cheap and all over the place! I got it whenever possible while i was visiting.